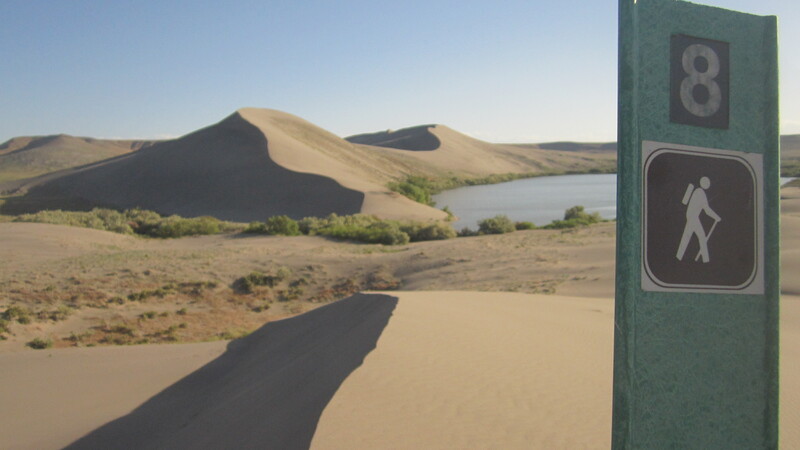 Bruneau Dunes brings back memories of a cold middle-school field trip where the wind blasted sand against my skin while I used a piece of cardboard to “sled” down the dunes. Thankfully, I’m older now, and my adult field trips can be better timed based on the weather. This beautiful and easily accessible place ($5 admission fee) can be a great experience for the day-tripper or weekender if you’re prepared. 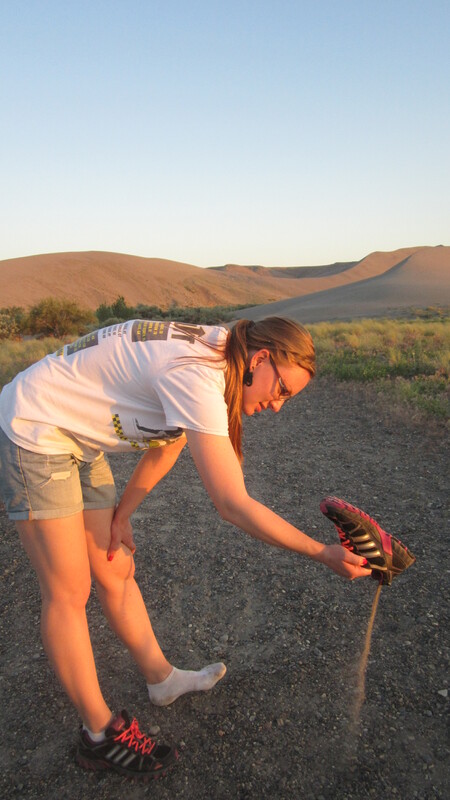 Bruneau Dunes can get so hot, windy, and mosquito infested that the sand in your underwear will be the least of your concerns. 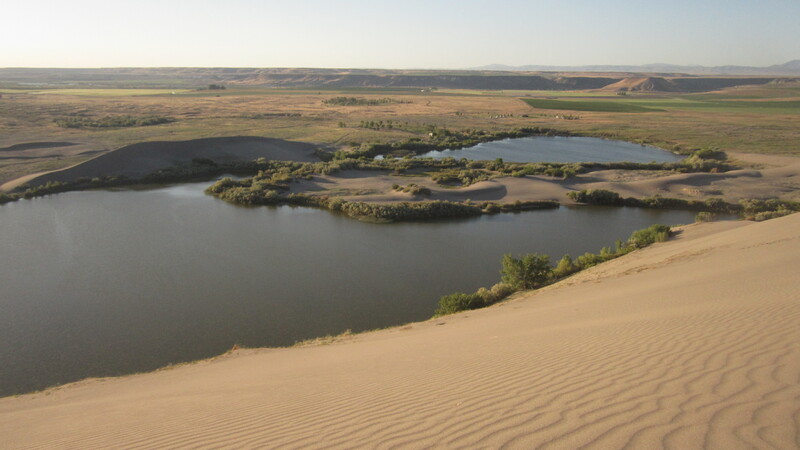 I left Boise at 5pm, arrived at Bruneau at 6:30, and seeing that the dunes would be more of a challenge than expected, I decided to forgo the advertised 6-mile hike that goes across open terrain that you can drive near (OFFICIAL PARK MAP) and make my own trail that circled, from the observatory, the dunes and small lakes. We set off, passing fisherman and planning on returning just for the observatory (only open Fridays and Saturdays). We were met by thousands of moths near the lake. My hiking partner and I had never seen so many in such concentration. We hiked through sections of buzzing mosquitoes without bug spray as well, and as I write, I’m trying to itch the six or so bites that redden my skin. This place is rewarding though, especially when the conditions are right and you’re prepared. We we stunned by beautiful views of the dunes, of the park, and of the distant horizon. Sand blew away from our steps as we walked near the edges of the dunes. Making the ascents up the dunes were physically tiring, but well worth the energy. Also, how many people can say they’ve stood on top of “the tallest single-structured sand dune in North America with a peak rising 470 feet above the surrounding desert floor”? 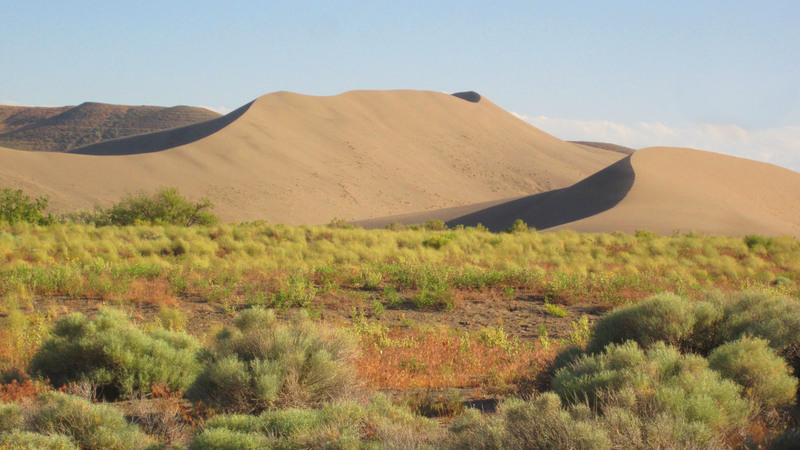 (http://parksandrecreation.idaho.gov/parks/bruneau-dunes). This trip reminded me that adventuring is largely about the attitude. When faced with something surprising, like hoards of mosquitoes or a situation that requires more effort than expected, pushing through and focusing on the rewards, like the beauty of the landscape or your own ability to preserver. Have fun out there and if you would like to ask questions or share your own experience with Bruneau feel free to drop a line in the comments. My hiking partner dumping sand for the 5th time.